Once asked to explain how he had sustained himself over so many years of struggle, Cesar Chavez responded: "I don't think I could base my will to struggle on cold economics or some political doctrine. For me, the base must be faith." In evaluating the life and struggles of Cesar Chavez, one of the most recognized Latino leaders in the United States and the first labor leader to successfully organize and unionize U.S. farm workers, many historians, journalists, and other writers have largely missed one significant factor of his life-his faith and deep spirituality. 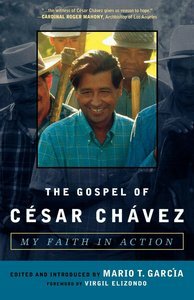 The Gospel of Cesar Chavez uses the prolific leader's own words to express his profound faith and the way it shaped his life and leadership. About "The Gospel of Cesar Chavez"